My morning committee finished the hearing process, and tomorrow starts the actual spending bills. The first of next week is scheduled for the largest part of the yearly funding, education. We are still trying to find a way to place 3 million in a building fund at the U of Idaho. The effort would support our potato industry with a more secure place to continue the work on potato seed. Over the years, there have been an efforts to remove the “famous potato” from the license plates in Idaho. And perhaps you can remember the special state quarters when then Governor Kempthorn chose the falcon as the symbol on our quarter instead of the potato. Just a side note, while we produce tons of cheese and many other crops, the 13 billion pounds of potatoes produced each year would fill BSU stadium one mile high. As for Idaho products, there is a bill being introduced to make Huckleberry Pie the Idaho dessert. Seems a little frivolous but who knows? A much more needed bill on a different subject did pass. For those of you who take and love the children who otherwise would have no parents, this effort would give a tax credit up to $10,000 to help cover the many costs of adoption. That was an easy vote and a great big thank you wonderful adoptive parents. I have not seen the bill coming to protect us from foreign law. One thing I do know Idaho judges take an oath to uphold the laws of the United States and the State of Idaho. We are in the process of making additional laws that apply within our borders. Our courts will interpret those laws to make sure they uphold our State Constitution. This bill seems to imply that Idaho judges will violate their oath of office. We can hope those who will be voting know some of the fine judges that I have worked with over the years. We have several very large issues yet to solve. The loss of the Federal Funds to supply taking books to elderly and those with poor eyesight is still an issue waiting for an answer. It would appear the federal tax funds will not be available. It is my hope, we can provide a continuation of this service. Last year 3,400 Idahoans used the service, with about 1 in 5 of us have a vision-related disability. Both the House and the Senate took time this week to commemorate the life of Abraham Lincoln. In the Senate chambers, AHCS orchestra students from Idaho Falls performed patriotic medleys for legislators. 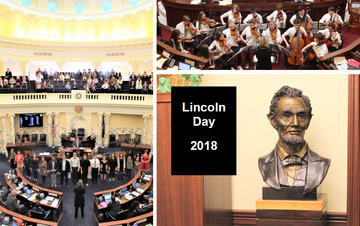 Across the rotunda in the House chambers students from the Idaho Fine Arts Academy of Vocal Music performed the “Star Spangled Banner” as well as Civil War era melodies. Representatives also unveiled the Dean Estes Lincoln Bronze Bust which will soon be on permanent display in the Lincoln Auditorium hearing room of the Capitol. I have completed another busy week with trying to find neutral ground on non-compete as well as a bill dealing with pharmaceutical benefit companies. We are getting closer to revising each bill and both could help our businesses be more competitive which always translates into reduced costs for the consumer. I also attended a meeting on workforce development and we certainly see the opportunity for skilled workers in Magic Valley. 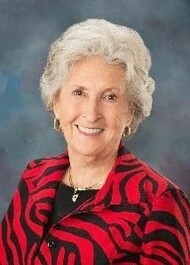 I am on the advisory board for the industrial commission concerning workman’s Comp. We discussed timely payment of benefits for injuries on the job as well as possibly new coverage concerning PTSD for police and firefighters. A real concern but difficult to define and treat. On my local government and tax committee we finished the rules and some legislation. This week, legislators will say goodbye to the pages who have served during the first half of the session. The House/Senate Page program is for high school seniors between the ages of 16-19. A Page's first responsibility is to render service to Lawmakers while they are on the floor debating. Secondly, the page is assigned to a specific Committees to give assistance to the committee chairman and secretary. The hours of service are Monday through Friday from 8-5 pm. for a six week duration. For more information about the Page Program click here. District 25 Legislators welcome the new pages who will serve during the second half the this legislative session. This week HB 513 that I sponsored came from committee and was heard on the House Floor where it passed and will be sent to the Senate Local Government & Taxation Committee. 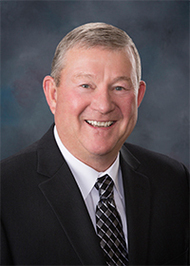 The purpose of HB 513 is to provide a sales and use tax exemption for the Idaho Association of Free and Charitable Clinics and its member Clinics. There are currently 10 members of the Idaho Association of Free and Charitable Clinics which are located in Sandpoint, St. Maries, Lewiston, Caldwell, two in Garden City, Boise, Twin Falls, Shoshone and Pocatello. This bill will add these free clinics to the definition of health-related entities. 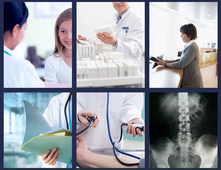 This tax exemption will help Idaho's Free Medical Clinics provide additional healthcare products and services to indigent patients who lack insurance. It will also decrease indigent healthcare expenses paid by Idaho counties and the state catastrophic fund. Currently 6% of the funds raised to purchase medical equipment, supplies and other patient care needs is not spent to help patients, but instead must be used to pay sales tax to the State. If 20% of free clinic patient visits would alternatively have been provided by a local hospital with an average emergency room visit cost of $1,178 that savings would be $4.2 M which is a great return on investment. This week we received an annual report from the Local Highway Technical Assistance Council (LHTAC) that serves 192 cities, 33 counties and 63 Highway Districts. During the last year LHTAC provided over 2,200 hours of technical assistance and personal outreach to local highway jurisdictions statewide. Which included 129,000 pound Truck Permits, Local Road Inventory Speed Studies, Traffic Counts, North Idaho Urban Cabinet, Federal Highways Emergency Relief and Regional Transportation Meetings. 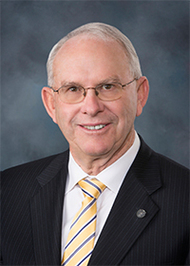 LHTAC council is made up of County Commissioners, City Mayors, and Highway District Commissioners from all areas of the State. This week I also met and visited with the College of Southern Idaho, Idaho Conservation League, Idaho Trucking Assn., Idaho Farm Bureau, Twin Falls Chamber conference call, students from St. Edwards Catholic School and a meeting with Magic Valley teachers and administrators. Diagnosed when she was six years old, this nine year old manages her Type 1 diabetes (T1D) with the help of her service dog who warns her when she is experiencing a low glucose level. 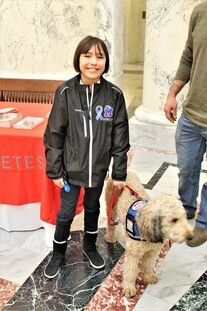 She came to the Capitol to share her experiences with lawmakers on the Diabetes Awareness day. Representatives from the Juvenile Diabetes Research Foundation (JDRF) also provided information to legislators and the public regarding a cure for T1D. JDRF is the leading global organization funding T1D research. Its mission is to accelerate life-changing breakthroughs to cure, prevent and treat T1D and its complications. It is an organization built on a grassroots model of people connecting in their local communities, collaborating regionally for efficiency, and uniting on a national level to pool resources, passion and energy. Click Here to learn more about JDRF.